Seventeen years ago I was a brand new SLP graduate. I accepted the only mid-year job that I could find (overage for 2 SLPs with high caseloads) and began on a crazy adventure. One of the classrooms that I was to be serving contained students who were profoundly impacted by a variety of disabilities. I remember very little about these students, except that they had to go on the floor for different positions throughout the day and were set up to hit cause/effect switches to activate lights and music. This classroom began my journey across the country to learn more about AAC and AT and helping nonverbal children communicate. Fast forward nearly two decades…I feel like I still know so little. I began my internship sure that I would know the “right answers”, only to find that there are no right answers. I was convinced that all of my students needed $10k dedicated devices, only to see them broke and abandoned. Then I was sure that $500 iPads with apps were the perfect solution. The problem was that we were spending hundreds of hours getting funding, only to have the devices collecting dust at home. So, we are taking some steps back and really focusing on low-tech AAC. Our first job has been to get staff participation in modeling. I am providing once a month staff training on using core vocabulary with visuals throughout the day. However, discussions with an autism specialist and recent AAC trainings have made me ponder pros and cons of various low-tech systems. Below I have a list of pros and cons that I’ve compiled regarding three popular low-tech systems. 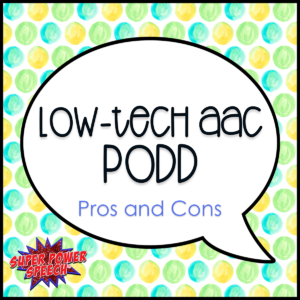 In today’s blog post, I will go over some of the pros and cons of PODD (from the perspective of an average school-based SLP trying to balance many systems and many kids). Stay tuned for future blog posts about Core and PECS! Robust vocabulary system: PODD books can contain hundreds of words on every possible topic of conversation. If there is not a page already pre-made on a topic, you can create your own! Pragmatically organized: Pages are organized by topic to make it easy to stay on one page when talking about one topic. For example, if you are playing doll house, you can make comments, ask questions, and use fringe vocabulary all from one page. Functions of language (request, comment, question) taught: PODD books make students consider from the beginning if they are asking for something, making a comment, or asking a question. This is a very different approach than some other communication systems. Prioritized efficiency for social interaction: The PODD system is designed to encourage quick and easy social interactions. One page access: Using the PODD system, the user can print one page and place in an environment conducive to that vocabulary (such as “blocks page” in the blocks area of a classroom). Heavy and burdensome: A full PODD book can be huge. Staff may be very reluctant to carry it from place to place and so it can become covered with dust on a corner. Difficult to become fluent: On the surface, a PODD book is quite difficult to understand. It is full of reference numbers, tabs, and flipping back and forth. It can take months or years to feel comfortable and fluent in this system. Feels redundant: Because the system was created to have all words for a topic on one page, core words (I, want, more, finished) can be found on nearly every page in the book, however, not always in the same spot on the page. Limited for independent expressive communication: Because of the complicated references and tabs, PODD books are great for language modeling, but may be difficult for AAC users to use independently for expressive communication. With a communication partner helping to flip tabs, they can have much more success. Note: This post is part of a series on low-tech AAC. See the other posts in this series as they are published: PODD, Core Vocabulary, Picture Exchange. Comments closed: I am glad that there are many people who find fabulous success with PODD. The point of this series is to say that low-tech communication is AWESOME, but here are some things to consider when choosing systems. The judgments from certain commenters have turned what I had hoped would be a brief overview into an attack on me personally. If you feel there are no cons about this system, that is great, but please don’t attack me on a public social medium.